Posted on September 12, 2012, 8:00 am, by Ivan G. Shreve, Jr., under Classic movies, Radio mystery, Whistler. Series star Richard Dix plays wealthy industrialist John Sinclair, whose quest for money and power has left him in precarious health and prone to collapsing spells. While in Chicago to board a ship that will take him on a cruise to recuperate, he succumbs to one of these spells…and if weren’t for the quick thinking of Cockney cabbie Ernie Sparrow (Rhys Williams), Sinclair might not be long for this world. Sparrow, an ex-pugilist, takes Sinclair (who has adopted the name “John Carter” though he’s never been to Mars) to a neighborhood clinic so that a doctor can examine him. 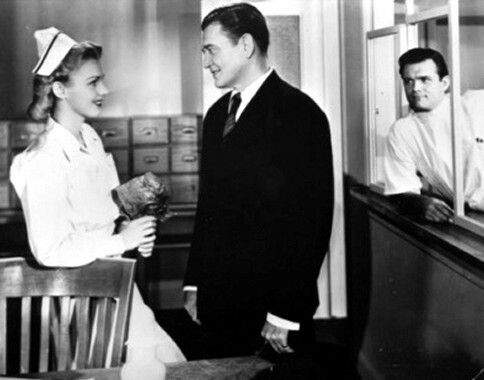 While waiting to be seen, Sinclair/Carter also meets a young intern named Fred Graham (James Cardwell) and the clinic’s nurse-receptionist, Joan Martin (Lynn Merrick). 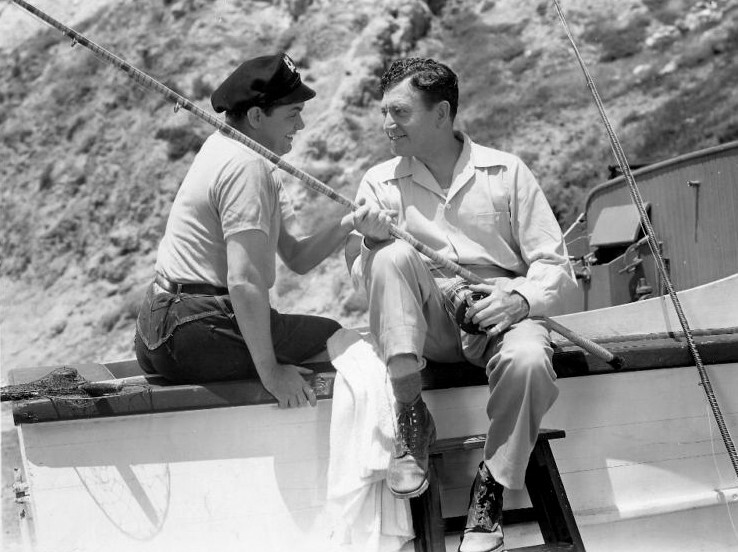 Dr. Rose (Frank Reicher), the clinic’s head physician, diagnoses Sinclair’s medical troubles as loneliness—Rose suggests that rather than undergo a sea trip it would be better for Sinclair to relocate to Maine, where he can avail himself of both sea air and the company of people. A grateful Sinclair asks Sparrow to join him, but Sinclair also asks Joan along as well in the form of a business proposition. Revealing his true identity to her, he suggests that if she agrees to marry him, he’ll leave her his entire fortune when he passes on…and after all, he’s only been given six months to live. This news doesn’t sit particularly well with Doc Graham, who also happens to be Joan’s fiancé…but Joan possesses a selfish streak, one that has left her tired waiting for Graham’s ship to come in (she also thinks him too pliable and “soft”) and so she’s going to have a grab at the carousel’s brass ring. Complications soon develop when Sinclair’s death does not arrive on schedule…the experience of living in Maine (in a reconstituted lighthouse) has proved invigorating and made him a new man—one that’s also fallen in love with Joan. But, Joan finds her isolated existence with Sinclair and Sparrow stifling…and things only get worse when ex-fiancé Graham shows up for a visit. 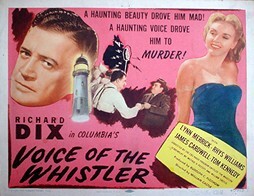 Though Voice of the Whistler doesn’t quite contain the suspense that’s the hallmark of many of the Whistler movies, it’s still a first-rate vehicle for the franchise. The ending of the film is poignant and haunting (even if Castle does kind of telegraph it a bit at the beginning), and the only real weakness in the movie is that it’s sort of a poky little puppy through the first two acts before getting down to brass tacks in the third. Fittingly, Voice’s plot—which hinges a lot on both coincidence and the selfish motives of the three main characters—is very much in keeping with the tone of the classic radio program. There are also one or two scenes of Castle-scripted levity, particular a sequence at the beginning that slyly ribs the “News on the March” newsreel from Citizen Kane. Tom Kennedy, a stock player at Columbia who worked in the studio’s comedy short subjects with funsters like El Brendel and Shemp Howard, is included in the main credits for a brief appearance as an ex-wrestler-turned-flower merchant named “Hammerhead” Ferdinand. Kennedy does an amusing bit of business with a couple interested in purchasing his wares, played by character favorites Minerva Urecal and Byron Foulger. Other familiar faces in the film include Martin Garralaga, John “Perry White” Hamilton, Gigi Perreau…and Otto Forrest as the omnipresent narrator. 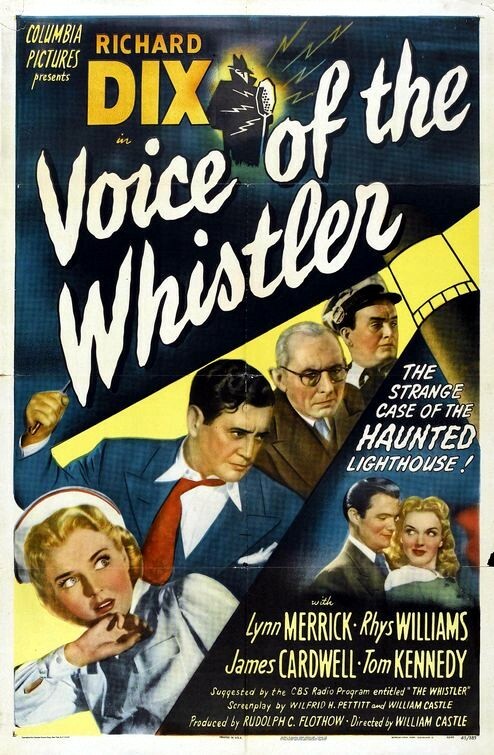 Voice of the Whistler will air this September 15th at 10:45am on Turner Classic Movies as part of the channel’s month-long scheduling of these classic B-noirs. 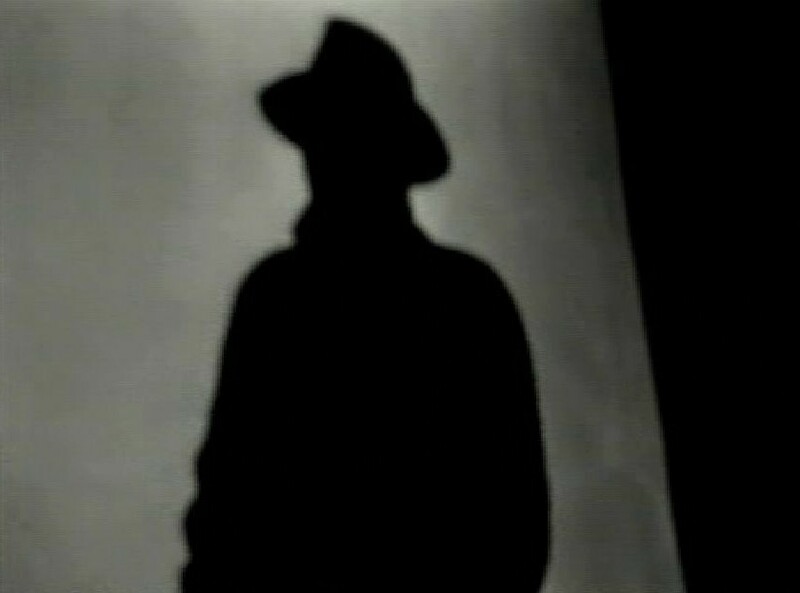 Next week at Radio Spirits: William Castle’s Whistler swan song—Mysterious Intruder! I love all of the Whistler movies — I’m not very discriminatory about them. Richard Dix is a favorite, and they are just plain fun. I listen to the radio show many evenings. Really enjoying your reviews.